First things first! Welcome to all those new subscribers to the REStevensArt Newsletter! Thanks bunches for your interest in my art! Many of you probably don't know but in addition to causing a ruckus with painting, drizzling and assorted mixed media concepts, the biggest project in my life for the past year and a half has been our short film, Learning to Drive. It is inspired by the true story of a feisty young man with Down's syndrome determined to convince his scatterbrained brother to teach him how to drive. I have been leveraging my art for the past almost two years to help make this film a reality and we're almost there. You can learn more about the film at www.learningtodrive-movie.com! Check out the latest 1-1/2 minute teaser from "Learning to Drive"!!! Sc01 720P H.264 from Roderick E Stevens II on Vimeo. And now on to some art!!! I thought I would share a few more of the "Drizzleisms", the hybrid mash-up of my reknown Photo-realism with my new "Drizzlescapes"! (right) "Paint Dipped Shoe - Pink". Some of you may recognize the foundation of this piece from my shoe collection of 2013! The original painting was a Blue Dipped Shoe, but I've since re-imagined it in a few different colors. I then made a huge mess with more acrylic and enamel paints all over the canvas! :-D I'm not gonna lie . . . it's a whole lotta fun! 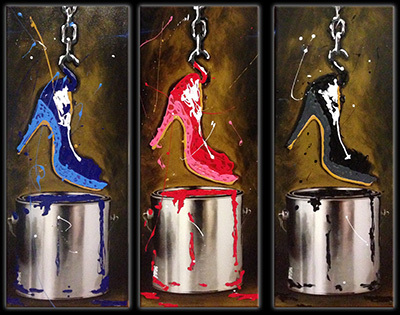 (below) I also have similar pieces available with Red, Blue and Black shoes in the 12"x32" size! These one-of-a-kind paintings full of energy and texture run $400! 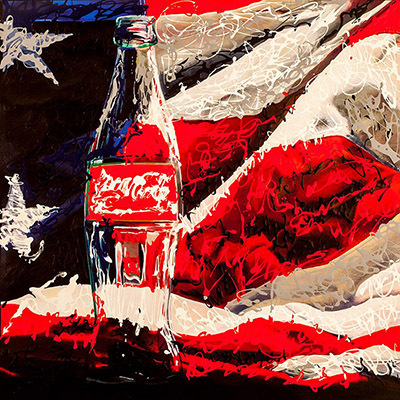 (below) And in case you missed it before, I present "American Cola Drizzled!" - 28"x28" Acrylic and Enamels on canvas!! (below) "Fruit Splash Drizzleisms" - This collage shows five separate paintings. 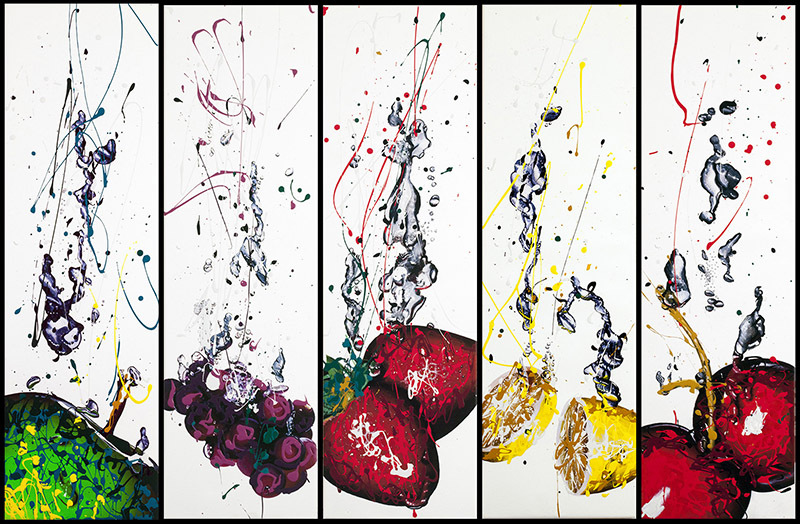 Each of these 9"x30" pieces takes a variation of my popular fruit splash series and splashes it up some more!! These run $300 each, with discounts for multiples of course. One more show here in Colorado before I head back to my desert studio! If you're up for a gorgeous day-trip, come see me in Breck!